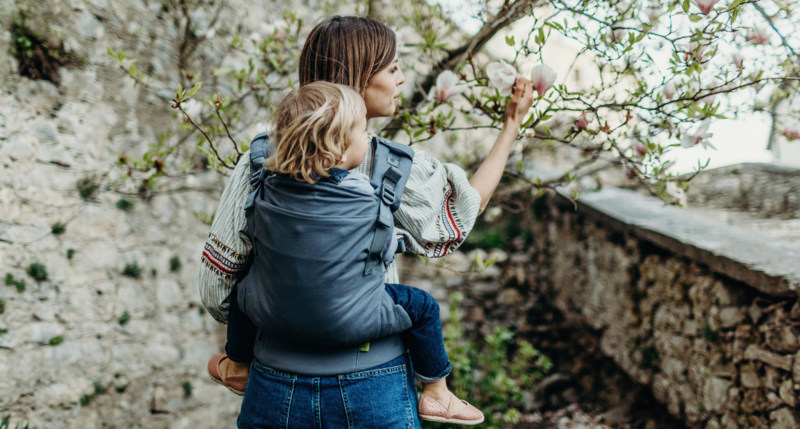 Whichever type of carrier you’re using, and however young or old your little one is, safety when carrying will always be the primary concern. But how do you ensure you’re using your carrier safely? And how do you know if something is a safety issue or more about comfort? There is no evidence that hip issues can be caused by using a carrier that is narrow. Babies with hip conditions are born with that condition; it is not caused. There IS, however, evidence that existing issues can be exacerbated by using a carrier that doesn’t support their legs and hips in an ergonomic position. Because of this it is felt that it is preferable for all babies to be supported in an ergonomic position; especially as hip issues may not yet have been diagnosed. However, a baby with healthy hips can not develop hip issues due to a sub-optimally supporting carrier. An ergonomic position means supporting baby’s legs from one knee pit to the other, with bottom lower than knees. Adjusting baby into this position is called the ‘pelvic tuck’. For newborns their knees will tend to be no wider than hip width apart. As their muscles develop they will begin to wrap their legs around the wearer. The position of baby’s legs, as seen from the front is commonly called the ‘M position’, and from the side it is often referred to as a ‘J position’. Most of the well-known carrier manufacturers’ products are certified ‘Hip Healthy’ by the Hip Dyslpasia Institute, so it’s worth looking out for that certification on the box or website, to ensure the carrier you’re looking at is going to support your little one in a comfortable, ergonomic position. Until baby has full head control, it is essential they are held securely against the wearer with their airways unobstructed, allowing air to circulate freely. This is to ensure clear airways are maintained. The ‘Close Enough to Kiss’ term came about to address the issue of babies being held very loosely, with their heads carried very low on the wearer. It certainly helped with this issue, however, it can be a little misleading. For example, it is possible to carry baby with their head between mother’s breasts – so at risk of restricting airways – but still be able to kiss the top of their head, depending on the wearer’s flexibility. A less misleading term is ‘head on wearer’s upper chest’. This still meets the ‘Close Enough to Kiss’ criteria, but removes the margin for error. As baby gets older, they may be worn on the back (where it’s not possible to kiss them so easily!). It’s also perfectly possible for a baby to be carried lower on the wearer’s front, but still maintain clear airways. This is particularly applicable to men carrying their babies on their front. They may choose to carrier them lower, but providing they are held securely against the wearer to ensure they can’t slump, with clear, unobstructed airways, they can be carried safely. When back carrying, especially if doing so before baby is able to sit up unaided, it’s advisable to have them in a position where you can check on them regularly. This is often most easily achieved by positioning them high on your back, so you can look round over your shoulder and check on them relatively easily. Many children also like to be able to see over the wearer’s shoulder (which is one of the reasons people tend to start back carrying as their little one can see a bit more from this position than on the front, facing in). As with carrying on the front, it’s important to ensure your child has clear airways at all times and is supported securely, so they can’t slump or fall out of the carrier. Particularly with older babies and toddlers, this is perfectly possible to achieve in a lower back carry position. Providing your child is held securely, with clear airways maintained, how high they are positioned on the wearer’s back is generally down to personal preference and comfort. A lower back carry tends to be more popular with men, who are likely to have longer torsos and/or be taller, so have more flexibility in where the carrier’s waistband can be sited. Research shows babies that are carried tend to be more secure in the knowledge that their needs have been met (with lots of cuddles during the daytime) and many will actually settle better, after being kept close to their caregiver during the day, than if they’d slept separately during the day. 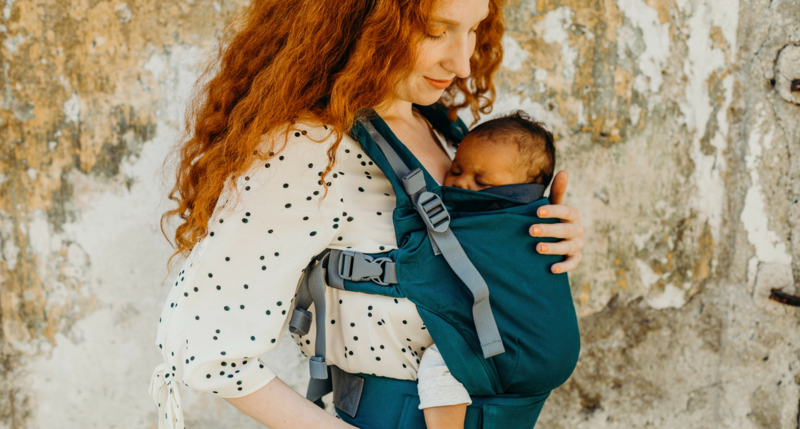 MYTH FIVE: If I buy an expensive carrier this automatically means my baby will be safe, doesn’t it? The most important factor when choosing a carrier is ensuring it fits you – the wearer – and your child. Some carriers adapt to fit all builds of wearer and sizes of baby. Others are a bit like choosing a pair of jeans; what fits one person really well doesn’t fit another well at all. Just because a carrier costs more, doesn’t automatically mean it will fit you well. As with anything, you also want to ensure you’re using the carrier correctly. 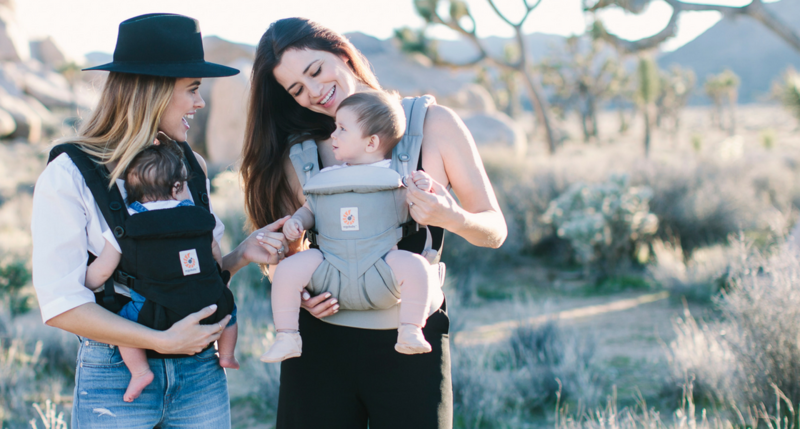 Does the carrier hold your baby as securely as holding them in your arms? Can you see their face and can they breath unobstructed? Is the top edge of the carrier no higher than the nape of baby’s neck, no lower than their armpits (once they have full head control)? 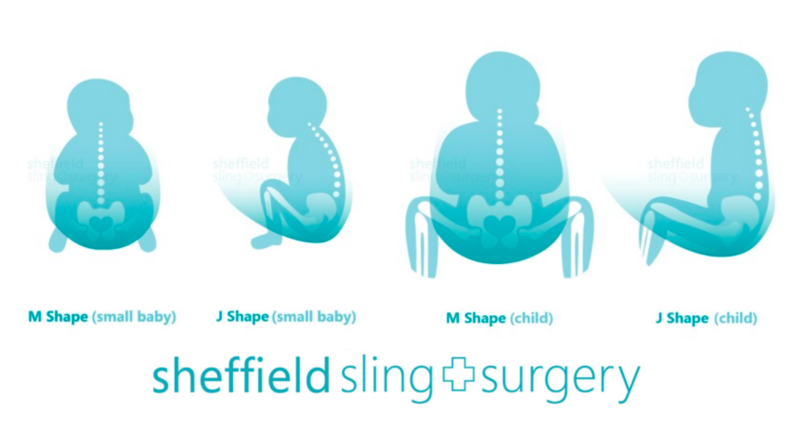 Is baby supported in an ergonomic position, appropriate to their developmental stage (see first image relating to ‘Myth 1’)? If you’d like to check how to use your carrier correctly, or need help deciding which is the right carrier for you, our YouTube Channel has a wide range of videos demonstrating safe, comfortable usage of many of the most popular carriers, for different ages of child. The videos demonstrate optimum positioning, run through safety checks and showing how the carriers are used. There’s also lots of tips to help you get the most from your carrier. If you’d like further help and advice, feel free to get in touch via our Contact Form to arrange a Consultation – either online or in person – and we’d be happy to help!